ARTNATOMYA is a Flash interactive english/spanish tool. 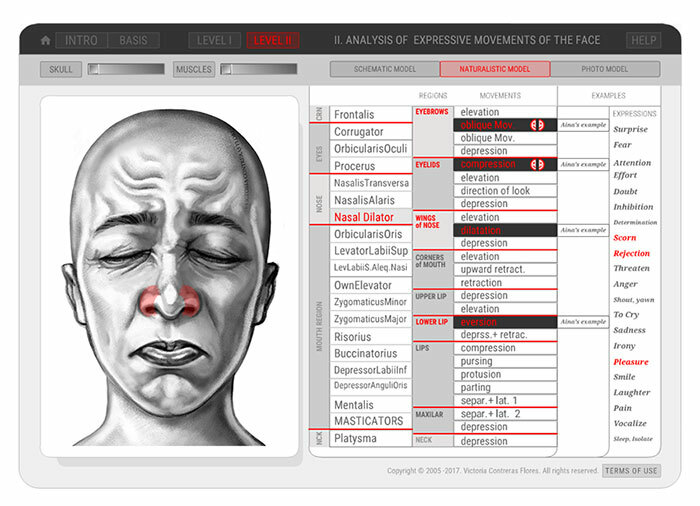 It is intended to facilitate the teaching and learning of the anatomical and biomechanical foundation of facial expression morphology. The task of the professor is also facilitated by the use of an expandable animated image (employing a projector connected to the computer), in addition interaction (controlled by the professor or students) is multifunctional, since the different levels and independent functions allow connection of the application contents to any educational program, providing real time delivery of examples to the student. "I begun to project this tool (which I have designed, draw and developed) by necessity, as a "war tool" for my pupils, by the time I taught at a Fine Arts University, in order to provide them the minimum information, and also make my job easier (not needing to manage thousands slides and photocopies...). I also supposed that a tool like this could be helpful for institutions not equipped at all. It has also been presented as Academic Work (in my way to became Doctor) registered in 2005, at the Drawing Department of the Fine Arts University (UPV) in Valencia (SPAIN), as "ARTNATOMY/ARTNATOMIA: Anatomia de la expresión facial: manual interactivo" (I want to thank Doctor Carlos Plasencia Climent: without his help and advice, the application would not be so complete and rigorous)." 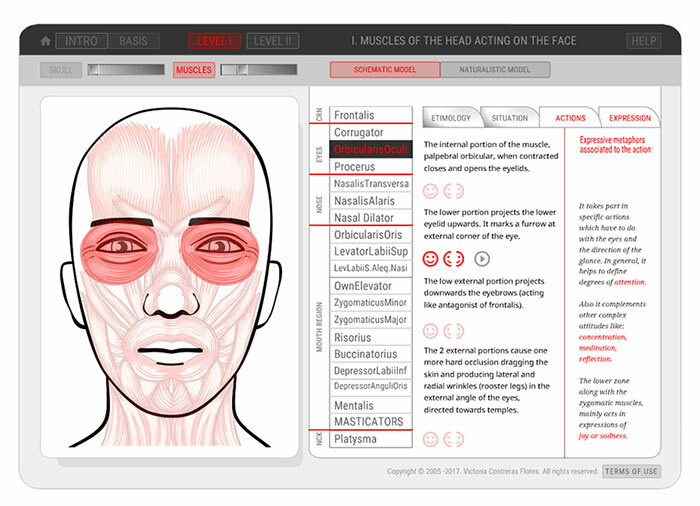 ARTNATOMYA was born for artists and animators, but it's also very useful for people working in other disciplines: psychologists (in order to study how emotions are revealed), neurologists (they use it to explain their pacients and pupils how some brain diseases affect the face mimic), dermatologists, plastic surgeons, aesthetics (who teach facial gymnastics), even actors! We' re really glad of the results and working now in a 3d versión and a more extended figure atlas. Hope it can help those that face the daily task of learning and teaching.